Over the last decade, wikis, blogs, social networks, social messaging, social sharing apps, google docs and other tools have been providing lighter weight, faster vehicles for collaboration and communication that the old lumbering battleships, office documents and email. Now Google’s Wave is a depth charge aimed at the battleships. Google Wave is based on a powerful technical concept, using a realtime chat protocol and stream model as the foundation for communication and collaboration applications. For these reasons, Google deserves a lot of credit for pushing innovation, rather than simply cloning the old models using servers in different closets. Fundamentally, Google Wave is technology-driven innovation. And Google Wave raises some pretty large questions about the cognitive and social models that people will need to understand and use Wave-based tools. The first big set of questions relate to the conceptual model. Wave attempts to mash up email threads, documents, and streaming communication. Each of these is familiar and not that hard to understand. The combination seems a bit mind-bending. Email and forums are clunky in many ways, but they mirror conversational exchanges in an understandable way. Albert says something, and Betty replies. However, when replies are interspersed between paragraphs, and the conversation digresses, it can get difficult to follow. Wave uses a collaborative document-like model to make the changes visible in real time. This is cool and clever. It also needs a rich combination of social conventions and features to not get completely incomprehensible. Communities using wikis rely on rich social conventions and gardening tools to dispense with the need for inflexible pre-defined workflows. Wave is a toolset with even more flexibility than a wiki, with even more interactive content. This poses even greater challenges to help people understand how to use it and be productive. The model of time has perhaps the greatest potential for confusion. In an email or forum thread, the latest contribution appears at the top of the thread. In a document, including a collaboratively edited document, there is a “face” to the document that appears as a working model of a final version. In a chat room, the latest comments appear at the bottom of the screen. In a rich “Wave”, it’s harder to tell which items in the wave are newer, older, more or less definitive, without scrolling through the whole process from the beginning. It is easy to imagine getting seasick. Another conceptual innovation is “replaying” a wave. In the conventional model, there are known techniques to reflect the current state of understanding. When there are comments interspersed between paragraphs in email/forum threads, it can be difficult for newcomers get the gist of what has occurred. But there is a time-honored way to bring people up to speed – summarize the conversation to date. The summary has a social purpose, too, it steers the discussion toward a state of current understanding. A document or PowerPoint presentation can look deceptively finished, and close off potentially warranted conversation. A document is an artifact that reflects the end of a collaborative process. But a document can also be summarized and skimmed. The presenters kvelled, and the audience cheered, when the demonstration showed new participants using “playback” to recap a wave to date. But this seems like world’s most inefficient way to get up to speed – to understand the end result of a conversation, you need to spend nearly as much time as the initial participants did in getting to that point. A streaming audio/video/screencast presentation, or a realtime chat, can be quite rich, and can be played back, but it isn’t skimmable or summarizable. It’s not clear that introducing that model to summarizeable documents and threads is a great thing. My biggest areas of doubt about the Google demo in particular is that in some ways the hybrid combines the worst traits of its parents. Does the result have hybrid vigor or mutant weakness? What mental models are needed to understand this psychedelic blend of realtime, threaded, and document content? The second set of questions relates to the social model. The Google Wave demo truly begged a large number of questions about social models for wave-based tools. The demo seemed to use a fairly primitive concept – an individual’s address book that lets that person add a new person to an email thread. As someone involved in designing social models for tools used by organizations, this model is an intuitive way to start, but does not go very far. First of all, who has the ability to add people to the conversation? Is it everyone, or only the person who created it? Can invitation be delegated? Can a person add himself or herself? Do these permissions vary by wave? What about existing group and networks? In social sharing tools like Facebook, sharing a message or object shares it with one’s social network (or a defined subset). Twitter, sharing is easly visible to followers, and visible with a little more effort by everyone. In organizations, there are pre-defined groups (say, the marketing team) that one might want to share with. The differences between these models make a vast difference between how the tools are used and what they are good for. Another issue is social scale. Adding people and making interspersed comments could be intuitive in small groups, but could easily get confusing or chaotic in large groups. Long ago, Roberts Rules of Order were invented to facilitate orderly conversations with large groups of people to debate contentious topics. Group blogs and forums have developed reputation and rating tools to address the signal to noise ratio on large groups. What sorts of rules, tools, and processes will be needed to have socially effective communication and collaboration in larger groups when Wave is used in the world? What the world saw in May was merely a demo. The Google team was up front about the state of affairs. They weren’t doing FUD-style theater claiming to have already created a completed application to scare competitors and stop other developers in their tracks. They were describing a prototype application built on a new platform, and encouraging developers to explore and extend the concepts they demonstrated. The reality of open-ness has not yet lived up to the promise. In order to join the developer program, you need to tell Google exactly what you plan to build with their new platform. Which is rather hard to say when you haven’t had the chance to play with it yet. Google is also promising to open source the technology. Open source works well when there’s a community engaged with the technology and contributing. It will be interesting to see if Google can be successful in turning its as-yet-private code and process into something that others participate in. In order for the social practices and designs to be worked out, people need to be using the technology. Google needs to get this technology out of the lab and into the hands of users and developers so people can start to figure out how and whether the conceptual and social model issues can be addressed. But it’s early days. As someone wisely observed on Jerry Michalski’s Yi-Tan call, an audio online salon that addresses emerging technology topics, it took three years for Twitter to get to critical mass, and Twitter has an extremely simple usage model and a trivially easy model for extensibility. Google Wave isn’t even out in the world yet, and is a lot harder to grok for users and developers. One of my favorite quotes is from Paul Saffo, “never mistake a clear view for a short distance.” Like hypertext did, the concepts embedded in Google Wave could take decades to make their way into common usage. As with hypertext, there may be many years of tools that instantiate concepts of real-time blending before achieving mainstream adoption. Google’s tools and apps may or may not be the catalyst that gets us there. In the mean time, this is pretty deep food for thought about how and where to integrate real-time communication and collaboration into regular work and life. Much praise is due to Google and the Wave teams for pushing the boundaries instead of cloning familiar models. There are some things that Apple makes easy, and others that stay complicated. If you have more than one computer – especially if you have Mac and Windows – handling backup and synchronization is a pain. I use a Windows machine mostly as a media player at home, and a MacBook for work and mobility. I had most of the iTunes library on the Windows machine, and a few things that I had bought on impulse while using the Mac. I wanted to use the Windows machine (an XP laptop with a busted battery and some Logitech speakers) as the main media player (because I own it), and the mac for sometime listening. I wanted it all backed up, ideally in a couple of places, and I had a 300G USB hard drive for backup. * reformat the hard drive to FAT32 so that it could be read/written from Windows and Mac. It had been formatted so that Windows could read/write but Mac couldn’t write. This multi-step process took a little bit of figuring out, with the help of Google and some nice folk at the Apple store. Once I figured out the steps, the implementation took a few hours but was pretty straightforward. I signed up for an online backup service, but didn’t use it because it seems like it will take a few days to back up my collection and that’s not practical. To make a second backup that’s not in my house, the way to go seems like a USB keychain that lives in my bag or wallet. I’ll rip some CDs and see what size I need. As the next step in the project, I’ll become the last person on the digital planet to RIP my CDs. Why am I only now getting around to ripping CDs and organizing a digital music collection? To make a long story short, I hadn’t taken care of the digital music collection because until Apple and the labels took off DRM I considered the digital stuff disposable, and bought as little DRM’d music as I could. I had spent the time in Austin mostly focusing on Austin music, mostly on CD. When I got to the Bay Area, I was heads down on work for a bit. When I came up for air, I wanted to “true up” my music collection and taste; I didn’t want to just listen to the things I already liked and things that are nearly identical. So I’ve been doing a little exploring with the help of last.fm and youtube and wikipedia. That’s a longer story that may or may not make it to blog form. I’m spending the xmas-to-newyears week on the east coast, with midweek in Boston visiting friends in JP, Brighton and Somerville. That itinerary has a serious “can’t get there from here” problem. Rental car parking is somewhere between awkward and impossible. The subway system is hub and spoke; getting from one one spoke to another is cumbersome. It would be pretty cool if Boston had what various European cities have: commuter bicycle rentals with easy access to the train station. Slow bus rides ahead, instead. ps. Why the reluctance to ride the bus? Because I get carsick reading on buses but not trains. at a San Francisco dinner shindig, with a group of startup people, money people, and others in the subculture. The genetic effevescence was about remix culture, clean energy, 3d hacking, and the digital native generation. I don’t know whether it is just me but every silver lining has a pretty heavy cloud. Clean energy is grand, especially if it can help compensate for the very large amounts of fossil fuel energy it takes to make our food. Remix culture is cool, except for the fact that it is largely illegal, and remixers could get priced out of the market in a non-net-neutral economy. Kids in the US will grow up with tech as a native language; and 50% of kids will be obese; and many will have fewer opportunities than their parents. People in the room felt free to snark about “your call may be monitored by the NSA”, but Senate Intel just voted not to investigate illegal spying. The polar bears are dying in the heat. The short-term looks fun and interesting; the longer term looks murky. So, in my first full day in California, I returned the rental car and got a rental commuter bike. My house is 2 flat miles from work on a lightly-trafficked bike route. Cycling is the sanest form of commuting when it isn’t pouring rain. Palo Alto has a passive-aggressive downtown street parking system. You can park for 2-3 hours at a time with no charge in a several-block zone marked with colored signs. Then, you need to move your car to avoid a $25 fine. So a workday in downtown Palo Alto involves getting up and moving your car every few hours. They don’t make it impossible to park by making sure there are fewer parking spots than people who want to park, like they do in Cambridge. They don’t have pirhana towing, like they do in the Boston area, where predatory towtrucks circle timed parking areas and abduct your car to a distant lot where it must be ransomed for an exhorbitant fine. They just make it really annoying. So far the transportation scheme is working. I’ve done the hour-long drive to San Francisco and Berkeley twice for fun things, and otherwise had a short and healthy daily commute. Lately, I’ve been choosing less fancy hotels with complementary wifi over nicer hotels with similar discount room rates, but add-on charges of $10 – $20 per day for network access. The algorithm worked splendidly, resulting in a number of quite comfortable, moderately priced stays thanks to the Orbitz search engine. Until this past week, when I stayed at the Guest House International Inn & Suites in Santa Clara. The bathroom door had a rather disconcerting fist-sized dent, which seemed like the traces of a highly unpleasant visit for someone. The in-room menu was for the enticingly named “Last Chance Restaurant.” Not kidding. To be fair, the pizza from this ominously named outfit was more edible than the name suggests. Just spent a few hours migrating email from Mozilla to Thunderbird. There’s a handy new mbox import utility that helps move the files. This kind of maintenance task isn’t hard but takes attention to avoid messing up. Excellent for holiday weekends. 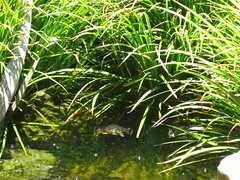 One of the water garden turtles at the Green Muse. So, the Flickr blog posting feature does post the picture, but generates an error message on Flickr. Also, the default MT template works better than the default Flickr template. So, I finally got a digital camera, and got it working. It’s a sign of the times that the weekend’s home maintenance tasks involve replacing the air conditioner filters and upgrading the weblog comment spam filter.